10. Early in 2012 we secured funding from the Paul Hamlyn Foundation enabling the recruitment of a much needed Business Development Manager post to help build the sustainability of the network in challenging times. We also created two new posts for research and marketing co-ordinators, essential to support the increasing demand from members for evidence and interactivity. Having a skilled core team in place has really helped us to move forward in leaps and bounds this year. 9. During the spring, Earlyarts Board was expanded to take on new expertise in cultural learning, social enterprise, children's media and early years provision in the private sector. New members on board included James Huggins, CEO of children's publishers, Made in Me, June O'Sullivan, CEO of the London Early Years Foundation, Sydney Thornberry, CEO of the Blackheath Conservatoire. Three founder board members continue their unwavering support: Joanne Albin-Clark, senior early years lecturer at Edge Hill University, Natasha Holmes, Artistic Director of Tell Tale Hearts theatre company, and Nathan Archer, Manager of Lincolnshire Montessori and Director of The Children's House nursery. 8. 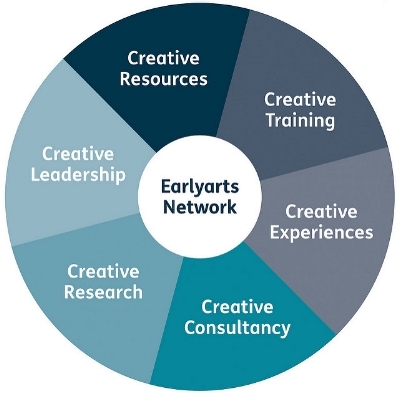 We conducted a full review of Earlyarts services and overhauled them to provide a more efficient and effective network service for our members, including new membership packages for individuals and organisations which began in April 2012. 7. The Earlyarts Website was also re-designed in response to our new business strategy, revised membership services, and the rebranding of the network. We were so relieved (along with many of our members) to be able to find the information we needed and communicate easily with each other once again through the much improved mailing system! 6. Earlyarts fabulous 'Pathfinder Programme' came to a close, with the last Professional Development Days (PDDs) in May due to the increasingly challenging climate for intense, day long training, and to enable space to address the needs of the revised EYFS. Youth Music funding through the Spotlighting project enabled us to evaluate the impact of the PDDs on the creative skills and confidence of the arts and early years professionals who attended. They helped us make some fantastic short films of their responses! 5. Summer 2012 saw the launch of Earlyarts first Earlyarts Six Pillars of Effective Practice, identifying the six core areas our members said they needed most to support their creative early years practice: creative training, cultural experiences, partnerships across the sectors, current research and evidence of impact, leadership development and creative resources. The strategy identifies the key issues being addressed by enabling young children's creative potential to be nurtured, and the six pillars help guide our journey towards making this happen as a community. With a clear drive towards higher quality in all our provision, this strategy forms the core of all Earlyarts services. 4. Our first Leadership Masterclass, led by Baroness Estelle Morris, was a highlight of the year for many of us. Starting with a comprehensive session on the latest policy, research and curriculum landscape, the former Secretary of State for Education, Estelle Morris then ledan investigation and analysis of the implications of this for our organisations and some cutting edge insights to help us plan more strategically. All delegates left that session hugely inspired and fired up to face our future challenges. 2. The rest of the summer was taken up with exciting preparations for Earlyarts International UnConference 2012, which was hosted by our wonderful partner network, moonbeams, at the prestigious mac birmingham. Over 160 professionals in arts, culture and early years came together to share and celebrate some of the best ideas for creative practice, topped off by some thought provoking presentations from Earlyarts Patrons Baroness Estelle Morris, Sir Ken Robinson, LEYF CEO June O'Sullivan, children's commissioner Dr Maggie Atkinson, M6 Theatre and a myriad of fantastic practitioners and researchers. It took us a while to catch up on our sleep afterwards, but the feedback from our lovely delegates made it all worthwhile. 1. There was hardly a moment to draw breath after the UnConference before we found out that I was one of the finalists for the Social Enterprise of the Year award 2012. Although the final award didn't have our name on it, I was completely delighted (and just a little bit proud!) that Earlyarts got so far. For us, this represents a national recognition of our commitment to social enterprise, and finding more efficient and innovative ways to support partnerships across the early years, arts and cultural sectors. What advice on early years quality would you offer?